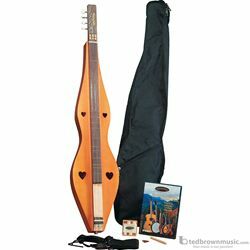 Explore traditional American music with the Appalachian APD-1 Dulcimer outfit. It's made of gorgeous spruce, mahogany and Indian rosewood and has a matte finished for a classic look. The tuner is chrome-plated and has a stoptail bridge to adjust string tension. This stringed instrument is designed for both right- and left-handed use. The kit has a tuning pipe, guitar picks and a slide. Store and carry the set in the provided gig bag. Includes an instructional DVD. Ages 10 and up.